OSI is an American progressive rock band, originally formed by Fates Warning guitarist Jim Matheos in 2002. Chroma Key keyboardist and vocalist Kevin Moore is the only other full-time member of the band. The collaboration may be considered a studio project, as its members and contributors write and track most of their material independently, sharing and developing tracks long-distance, only coming together at the end of the process for mixing and additional tracking. The band's name is a reference to the Office of Strategic Influence, a short-lived American government agency formed in 2001 to support the War on Terror through propaganda. The band has featured a number of guest musicians on its albums, including Steven Wilson, Mikael ?kerfeldt, Sean Malone, Joey Vera and Gavin Harrison. Matheos recruited Moore and Dream Theater's then-drummer Mike Portnoy to perform on what was originally planned to be a Matheos solo album. 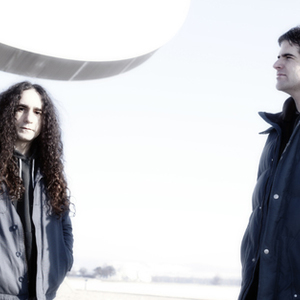 Matheos and Portnoy originally planned to produce a progressive metal album similar in style to Matheos' work in Fates Warning. Moore changed the music's direction, incorporating electronica into the original progressive metal sound. The band's debut album was released by InsideOut Music in 2003. OSI was originally intended to be a one-off project, but Matheos and Moore found they both had gaps in their schedules so produced a follow-up. Free was released in 2006, with Portnoy returning to play drums as a session musician rather than a full band member, due to personal and musical differences between him and Moore. Blood was released in 2009, with Porcupine Tree drummer Gavin Harrison replacing Portnoy. The fourth album Fire Make Thunder was released in 2012 by Metal Blade Records, with Harrison once again on drums. Moore has described OSI's sound as "a new approach to progressive rock", combining elements of progressive metal and electronica. Moore considers the two genres to be "almost natural enemies", and that the conflict between the two genres "keeps [the music] interesting". Matheos cites progressive rock and heavy metal bands such as Genesis, Jethro Tull, Black Sabbath and UFO as influences. Moore described his influences as minimal techno, experimental, electronic musicians and "bands that play live and then chop it up". Matheos and Moore primarily work alone, exchanging files and ideas by email. The writing process for all OSI's albums has been the same, with Matheos sending Moore an idea "from just a guitar riff to elaborate, almost completed songs", which Moore then edits and sends back to Matheos. Moore, the band's vocalist and lyricist, has described the process of writing lyrics as an "audio Rorschach test". The lyrics on Office of Strategic Influence feature political themes, but the lyrics on later releases are less political, instead being based on Moore's personal experiences. "I'll start writing a song that has a little bit of a world view or political view or something," he said, "but then by the time I'm finished the lyrics it'll be about a relationship or something like that." On Blood, Moore largely abandoned his earlier stream-of-consciousness approach to writing lyrics, in an attempt to make the lyrics more coherent. "I didn't want it to be like 'Oh, you get your own impression of the lyrics. Everybody has their own idea!' I wanted to have an idea that I wanted to communicate, and something communicable," he explained. Moore has acknowledged the narrow range of his vocals. He considers his vocal style to "[come] from how I feel when I'm singing, when I'm in the zone of writing lyrics and recording which, a lot of times, comes as the same time. It's sort of an introspective time. A lot of the material lends itself to that kind of voice and that kind of spirit."